Does the U.S. really need another grocery store? It turns out that the grocery business in Germany is quite the competitive business. There are a number of different companies that are all attempting to lure customers in. Two of the largest of these German grocery chains are Aldi and Lidl. Aldi came to the United States a number of years ago. Since then they’ve set up a large number of stores. Aldi has been very successful and clearly Lidl has seen this and would like to emulate their success. Lidl is what is called a deep-discount grocery store. Their entry into the U.S. was not done without careful planning. They kept their eyes open until they saw an opportunity to enter a grocery market that was being served by three types of grocers: traditional grocery stores, cost cutters like Wal-Mart, and Lidl’s biggest rival, Aldi. The reason that Lidl thought that the U.S. market would be a good fit for them was because they had been doing very well across Europe and their strategy of offering customers affordable products has been a big hit with shoppers who are thrifty. Lidl decided to open their first U.S. stores in Virginia and North / South Carolina. As you can well imagine, when these new grocery stores first opened, they were successful in luring shoppers away from the more traditional grocery stores. That would have looked good on anyone’s product manager resume. However, this is when the Lidl product managers started having problems. What they discovered was that they were unable to sustain their level of traffic. Since the Lidl stores have opened, the other grocery stores including Kroger and Wal-Mart have been able to get back most of the market share that they had lost. What should Lidl do now? How Can Lidl Be Successful? The Lidl product managers have been prepared for setbacks like this. They view the initial set of stores that they have opened as being an opportunity for the company to learn, understand, and then adapt to the U.S. market. The key is for Lidl to be nimble and change with their customer’s needs. The product managers know that the Lidl grocery model works, the key is finding out how best to adapt it to the U.S. market. One of the challenges that the Lidl product managers faced as they started to open their U.S. stores was that the established U.S. grocery chains have been preparing for Lidl to come to the U.S. for a long time. The U.S. firms understood that Lidl’s success had come about by their ability to offer limited selections of inexpensive store-brand food items that were presented in stores that were small but easy to shop in. Lidl ran into another problem when they went to open their first U.S. stores: the first stores were opened the day before Amazon announced that they had purchased Whole Foods. The Amazon announcement caused all of the existing grocery stores to respond by slashing their food prices. Additionally, the existing grocery stores stated to invest more in their online ordering feature – something that Lidl does not currently have. The Lidl product managers realize that it’s going to take time to win over new customers. Customers are going to have to change their shopping behavior and allow themselves to get into a new routine. How we shop for groceries is something that can be very difficult for us to change. The Lidl product managers are going to have to find ways to get us to want to make that kind of change. The U.S. grocery market is currently ruled by three types of grocery stores: traditional grocery stores, Wal-Mart type cost cutters, and Aldi. The German deep-discount grocer Lidl has been watching the U.S. market and has decided that now is the time for them to enter. Product managers need to take a look at their product manager job description in order to determine how they can be successful in this highly competitive market. Lidl and Aldi are two of the largest grocery chains in Germany. Aldi has been in the U.S. for a number of years and now Lidl wants to join them. Lidl has been planning on coming to the U.S. for quite some time. Based on their success in Europe, they felt that they could do well in the U.S. They opened stores in Virginia and the Carolinas and initially saw a great deal of customer traffic. However, over time that traffic leveled off and people went back to their traditional grocery stores. The Lidl product managers were ready for setbacks like this. The U.S. grocery stores have had a lot of time to prepare for the arrival of Lidl. Amazon’s purchase of Whole Foods didn’t help things out for Lidl either. The Lidl product managers realize that it’s going to take time to cause customers to change their grocery shopping habits. The U.S. market for groceries is very large. There certainly is room for another player to enter. Lidl needs to find a way to take the success that they’ve had in Europe and bring it to the U.S. The product managers realize that it’s going to take time to figure out just exactly what it’s going to take to get grocery customers to switch to Lidl. Given enough time and enough patience, I suspect that they are going to end up being successful! 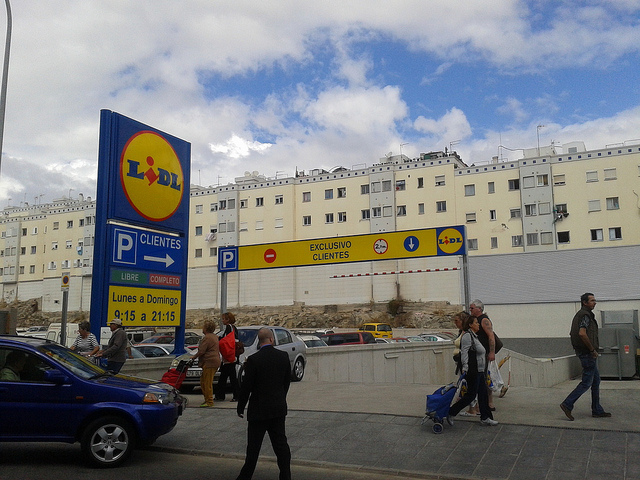 Question For You: Should Lidl attempt to compete with Wal-Mart or Aldi? As we all know, Amazon sells a lot of different things. However, there is one area where they are distinctly lacking in products to sell: luxury goods. It’s not as though the Amazon product managers have not held discussions with the Swatch, Gucci, LVMH Louis Vuitton, and other luxury vendors. However, so far they have not been able to reach an agreement with them. Perhaps the Amazon product managers are going to have to change their product development definition. What’s up?